My mother, Maaike Altink and her eldest sister Petronella Ruys-Altink (they are 17 years apart), went together with Pieter, the youngest son of her sister, to the Dam; people were celebrating, or that would be. So the three of us set off from the Nassaustraat to the Dam, walking. When we arrived there, a lot of people were at the Dam, and they were celebrating exuberant. There was a florist with his cart and members of the Domestic Armed Forces. They were amongst the celebrating crowd, in full uniform. In the Grote Club were still some German soldiers, they barricade themselves. 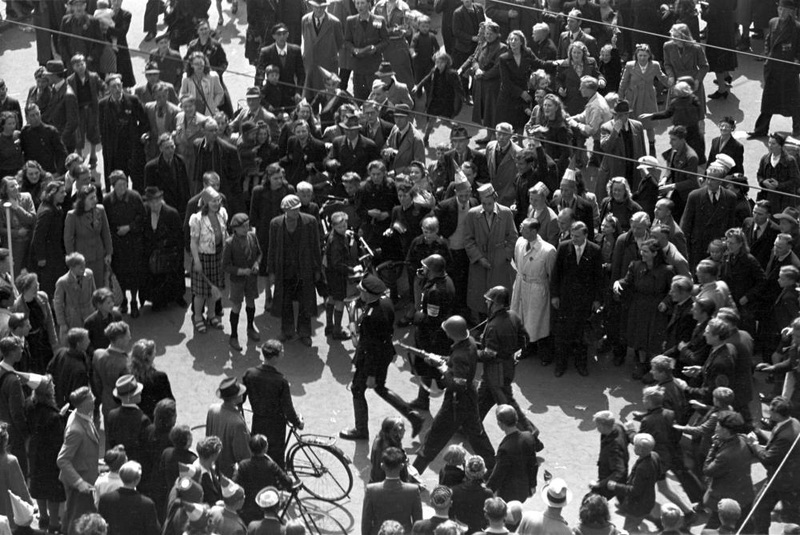 They were jeered by the crowd and the Dutch troops marched there around with their guns, aimed. So the Germans felt threatened, somehow. Suddenly out of the blue shots sounded and people fell down. My mother, sister and child fled away and search for cover behind the flower cart. In front of them laid somebody on the ground, dead or alive, they didn’t know that (editor:most likely it concerns, Johannes Straatmijer, who also lived in the 2e Nassaustraat). They laid there for a while. I don’t know if the pram is taken along or was left behind.The Dutch troops shot back and eventually the Germans surrendered. Who started the shooting was never made public; everybody thought the Germans but that was never proofed. My mother and her sister, with the little one, were totality in shock and from what I have understood, foolish, walked home. What should have become a celebration day became a tragedy. At the Nieuwendijk they heard in one of the side streets a lot of noise. A national socialist (NSB’er) was found in the alley. The person was beaten up until he bled. When they came home they cried and stayed indoors because of the fear that more German soldiers would walk around. After a few days things were going alright and it was quiet again.